Welcome to the Hermann's Tortoise website. This site has been set up by tortoise keepers to share our love of the Hermann's tortoise and to help promote good husbandry techniques for new keepers. If you're thinking of becoming a tortoise keeper it is likely to be a lot more involved than you first think. From where to buy your tortoise to feeding and husbandry requirements alot has changed in recent years. Much research has been done into keeping tortoises and these days keeping a tortoise in a glass vivaria and feeding it lettuce is definately not best practice. Hopefully thought this web site will start you off with the basics and give you the information you need to give your tortoise the best possible life. The Hermann's tortoise is a Mediterrainian tortoise which is part of the Testudo genus. The 2 main subspecies are the Western Hermanns (Testudo Hermanni Hermanni) and the Eastern Hermanns (Testudo Hermanni Boettgeri). The Eastern Hermann's is the most common of the subspecies to be kept in the UK and the largest. Femails will grow bigger than males, with an adult female reaching around 20cm and the males to around 15cm. The males though will have a much larger tail than the femails. The colour of the carapace can vary and often dulls with age but will be a yellow / tan / brown colour with black patches. If you turn your Eastern Hermann's over you will see there are 2 thick black bands running lengthways along the plastron. The bands are usually broken, not continuous. The skin of an Eastern Hermann's is mostly dark with the odd highlight of lighter colour. The Western Hermann's is much smaller in size than the Eastern Hermann's with an adult female measuring around 14cm and the males around 12cm. The carapace markings are much more defined and distinctive. The shape of the carapace looks more rounded than the Eastern Hermann's. The colouring is often golden / yellow and brighter than the Eastern Hermanns. Again the black markings are much sharper and defined. On the plastron the lengthways bands are again very well defined in deep black and will be continuous not broken. The skin of the Western Hermann's is lighter and very often there are small yellow patches behind the eyes. The Eastern and Western Hermann's tortoise both share a very distinctive feature; a bony tip on the end of the tail. Also, both are hibernating species. Read our To Do List to find out what essential things you should be doing NOW for your tortoise. 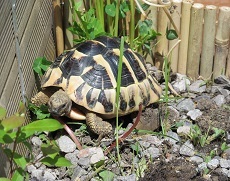 Tortoises are not all the same - different speicies can have very different requirements in terms or diet and husbandry. This web site deals only with the requirements of the Hermann's tortoise. If you have or are considering a different species then you should research their requirements separately. So what will your Hermann's tortoise need? Well, the Hermanns originate from sunny Mediterrainian climates so they are adapted to suit dry, hot climates. Without the right environment your tortoise may suffer from stress which in turn can lower its immunity to disease. Also, Metabolic Bone Disease (MBD) or lumpy shell is linked to poor diet, husbandry and lack of UBV and will reduce your tortoise's life span. The problem is that the UK is neither dry enough, sunny enough or hot enough so we need to provide additional heat, light and suitable substrates, both indoors and out. We have compiled two guides on indoor housing and outside housing that detail how to provide the best possible environment for your tortoise. A wild tortoise diet is extrememly varied and will change with the seasons. To reproduce a natural diet it should be high in fibre and calcium and low protein and will consist of a variety of leafty green weeds and flowers. Although for many years captive tortoises in the UK were fed on iceberge lettuce, tomato and cucumber these actually have no nutritional value to a tortoise so should be avoided. In additionl fruits should be avoided as they can lead to an increase in harmful parasites in the tortoise stomach. A suppliment containing vitamin D3 and calcium should also be given and water should always be available. Our tortoise diet guide will give you ideas of what to feed your tortoise.